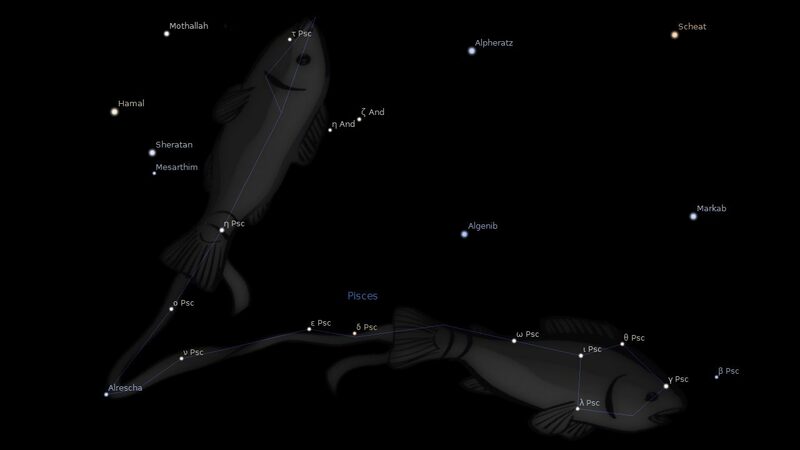 Constellation Pisces the Fishes, is an ecliptic constellation laying between constellation Aquarius and constellation Aries. It spans 43 degrees longitude in the zodiac signs Pisces and Aries. The Pisces constellation contains 9 named fixed stars. Venus and her son Cupid while sitting on the bank of the Euphrates suddenly saw Typhon, the enemy of the Gods, approaching them. They leapt into the river and were saved from drowning by two fishes, who were afterwards placed in the heavens by Venus in gratitude for their help. 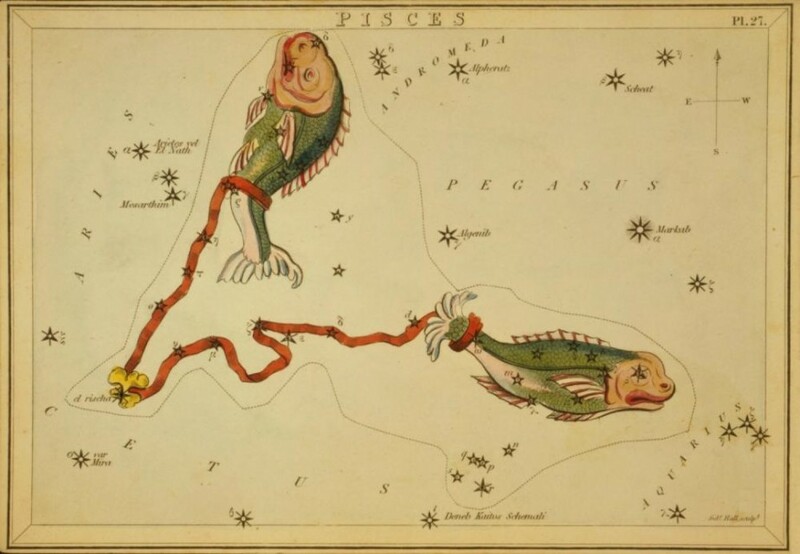 Pisces, the Fishes…The figures are widely separated in the sky, the northeastern one lying just south of beta Andromedae, headed towards it, and the southwestern one east from and headed towards Aquarius and Pegasus, the lucida (Alrisha) marking the knot of the connecting bands. Both are north of the ecliptic, the first culminating on the 28th of November, and the second about three weeks earlier. In early days they were shown close together, one above the other, but in reversed directions, although united as now. The Sign is pictured as two large fishes bound together by a Band, the ends of which are fastened separately to their tails. One fish is represented with its head pointing upwards towards the North Polar Star, the other is shown at right angles, swimming along the line of the ecliptic, or path of the sun. The ancient Egyptian name, as shown on the Denderah Zodiac, is Pi-cot Orion, or Pisces Hori, which means the fishes of Him that cometh. The Hebrew name is Dagim, the Fishes, which is closely connected with multitudes, as in Genesis 48:26, where Jacob blesses Joseph’s sons, and says, “Let them grow into a multitude in the midst of the earth.” The margin says, “Let them grow as fishes do increase.” It refers to the fulfilment of Genesis 1:28, “Be fruitful and multiply.” The multitude of Abraham’s seed is prominent in the pronouncement of the blessings, where God compared his future posterity to the stars of the sky, and the sand upon the sea shore. “A very great multitude of fish,” as in Ezekiel 47:9. The Syriac name is Nuno, the fish, lengthened out (as in posterity). 1. Fixed Stars and Constellations in Astrology, Vivian E. Robson, 1923, p.57. 2. Star Names: Their Lore and Meaning, Richard H. Allen, 1889, p.337-342. 3. Astronomica, Manilius, 1st century AD, book 4, p.243. 4. The Witness of the Stars, E. W. Bullinger, 21. Pisces (the Fishes).